BLOOMINGTON, Ind. -- The Jeff McLaughlin Quartet was chosen as the recipient of the inaugural Emerging Jazz Artist Project (EJAP) Award Monday, Oct. 25, during the David N. Baker Jazz Ensemble concert at the Musical Arts Center of the Indiana University Jacobs School of Music. The EJAP, planned to become an annual competition, is sponsored by Owl Studios of Indianapolis. It is open to jazz students in the Jacobs School of Music and culminates with a nationally released album. 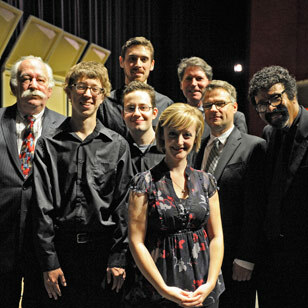 Left to right: Owl Studios CEO Al Hall, members of the Jeff McLaughlin Quartet, Dean Gwyn Richards, Assistant Professor Brent Wallarab and Distinguished Professor David N. Baker. The ensemble was unanimously chosen by a five-judge panel, which carefully considered 14 student ensemble submissions anonymously. Jacobs Dean Gwyn Richards, Owl Studios CEO Al Hall, project organizer and assistant professor Brent Wallarab and Distinguished Professor Baker were present as the announcement was made. "It has been incredibly gratifying to see how the Jacobs School of Music and Owl Studios have worked together to provide this unprecedented opportunity for our students," said Wallarab. "It is a reflection of the leadership involved, especially Dean Gwyn Richards and Al Hall, who encourage creative thinking and provide such a supportive environment to allow fresh ideas to develop." "This is an innovative project that has huge potential," said Baker, chair of the Jazz Department. "Giving students an opportunity to realistically prepare for their professional careers in partnership with a first-rate record label such as Owl Studios is a model that I expect will be adopted by any number of college departments in the future." In December, the quartet will go into the recording studio at Echo Park in Bloomington and begin its Owl Studios-supported recording. Owl will work with the group and guide it through the entire process of creating, designing and promoting a nationally released album, scheduled for release in the second quarter of 2011. "Owl Studios is happy to play a part of the already stellar education the students receive from the Jacobs Jazz Studies Department," said Hall. "I am truly honored to receive the inaugural Emerging Jazz Artist Project Award; this is an incredible and unique opportunity," said McLaughlin after the announcement. "I would like to thank J. Allan Hall, Brent Wallarab, David Baker, Gwyn Richards and everyone at Owl Studios and the Jacobs School of Music for making this project possible. I would also like to thank my group: Michael D'Angelo, Ashley Summers and David Linard for their inspiring playing and musicianship." "While there was one chosen recipient for this project," continued Wallarab, "I feel all of the participants have benefited already by having taken on the challenge of producing their submission materials, all of which were stellar. The Jeff McLaughlin Quartet is an excellent representative of all of the fine musicians of our jazz program, and I look forward to working with this group as the project unfolds." Before starting his master's degree in jazz studies at the Jacobs School of Music, McLaughlin, a guitarist, earned his bachelor's degree from the University of North Florida. He has been performing as a sideman and leader in big bands and jazz combos, and as a soloist for 10 years. He is an enthusiastic teacher and is currently an assistant instructor in the Jazz Studies Department.